Clifford White is a new age musician based in the UK who has been creating great music for quite a number of years now and like a fine wine continues to improve with age. 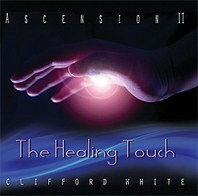 Clifford's latest release is called Ascension II: The Healing Touch and is actually a sequel of sorts to an album he released years ago called, not surprisingly, Ascension back in 1985. Unfortunately I have never heard Clifford's earlier album so my review will be strictly based on Clifford's current release without any comparrisons to what has come before. Besides I like to listen to music not so much based on what has been done by the artist in the past so much as I like to look at new collections of songs to see how it stands on its own in the here and now. Clifford White's musical sensibilities are evident from the first track right through the end of the album. Each song is an emotional journey that will leave the listener in a contemplative and peaceful state of mind as it weaves its spell around you. The music has been carefully crafted by Clifford so that each song simply becomes a part of the whole experience that is Ascension II and one tends to forget that they are listening to individual tracks after a few songs. Instead you find yourself submerged in the music as it washes over you like waves on a beach. One of my favorite songs on this new album is a track called Luna. It is a lush and dreamy tune that starts off quiety and simply and then adds elements to the mix as the song progresses. Clifford gives himself and the listener plenty of time to be drawn into the song as he fleshes it out during its 9 minutes of play time. There have been some songs that I have listened to over the years that 9 minutes would have been way too much time to endure but Clifford has crafted this softly captivating song as to allow the listener to find themselves adrift on his sound currents and paying little attention to the passage of time. In fact as the song winds down it felt like it ended too soon and that I could have drifted a ways further down the path without ever feeling like the song had gone on too long. Ascension II is comprised of 9 songs and a running time of over an hour so once you step into Clifford's soundworld you had best be prepared to simply let the hour drift by while you allow the ebb and flow of the music to take you to places you may have consciously forgotten. But given the right stimulus, Ascension II perhaps, these places can still be brought to the surface of our minds. Clifford uses nature sounds sparingly throughout this production but he does seem to insert them into the songs in just the right amount and at just the right times to make them very effective in creating the environment for his music to be move and breathe. All in all I think that you will find Ascension II to be well worth the effort to obtain your own copy and then spend some time listening to it. You will find that repeated listenings will allow you to enter more fully into the music and grasp some of the finer points that Clifford puts on his music. Clifford offers up some memorable melodies that really show off his writing abilities and his production skills acquired over years of honing his trade. Ascension II offers up an intimate collection of songs from Clifford White that shows that he has spent the last 25 years since the first Ascension came out exploring new realms with his music and he has been reluctant to stand still and do the same thing over and over again. Clifford allows his new age sensitivity to shine forth on this release and I'm sure that it will only enhance his already formidable reputation as a consumate musician and producer. Definitely recommended.